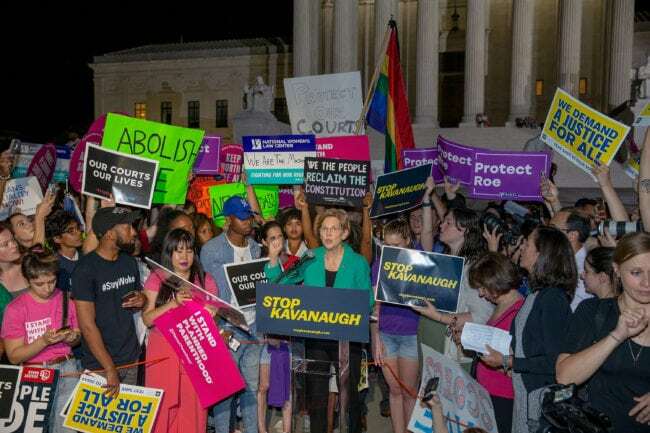 Hundreds of protesters gathered outside the Supreme Court in Washington DC on Monday night following President Donald Trump’s announcement of his nominee to fill a vacancy on the bench following Justice Anthony Kennedy’s decision to retire. 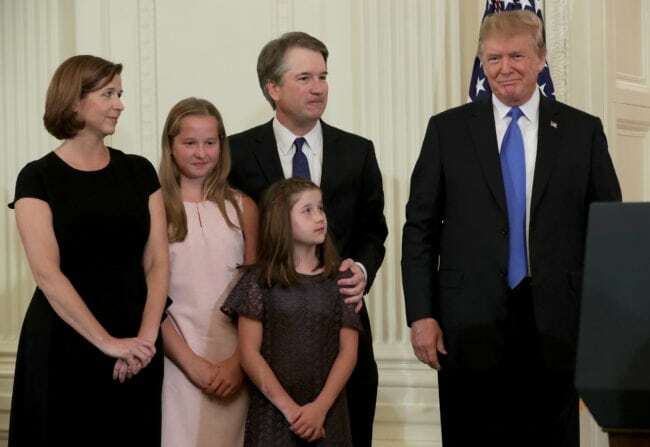 Trump introduced Brett Kavanaugh as his official pick to replace Kennedy, who was appointed by Ronald Reagan but was often a swing voter on issues such as abortion and LGBT+ rights. Kavanaugh, who is married and has two daughters, has been serving as a judge on the US Court of Appeals for the District of Columbia Circus since 2006 and is seen by Democrats and progressive activists as someone who could enforce a conservative agenda, rolling back civil rights gains for women, LGBT+ and marginalised communities. Kavanaugh now needs to win 51 votes in the Senate—the exact amount of seats controlled by Trump’s Republican party—with several Democrat senators already making clear they will oppose his confirmation. “Judge Brett Kavanaugh represents a direct and fundamental threat to that promise of equality and so I will oppose his nomination to the Supreme Court,” California Senator Kamala Harris wrote in a statement. Like Trump’s previous pick Justice Neil Gorsuch, Kavanaugh does not have a record on LGBT+ issues. However, his nomination was vetted by the Federalist Society, which The Daily Beast describes as an association of legal professionals with extremely conservative Catholic views that have already placed three justices (Aliton, Roberts and Gorsuch) on the bench. “This nominee was hand-picked by anti-LGBTQ, anti-choice groups in an explicit effort to undermine equality—and the prospect of a Justice Kavanaugh threatens to erode our nation’s civil rights laws, block transgender troops from bravely serving this nation and allow a license to discriminate against LGBTQ people in every aspect of American life,” said Human Rights Campaign (HRC) foundation president Chad Griffin, who was among those protesting outside the Supreme Court. GLAAD also issued a statement against Trump’s nominee. “Brett Kavanaugh will have the chance to codify Donald J. Trump and Mike Pence’s anti-LGBTQ record and the agenda of anti-LGBTQ groups into law for decades to come,” the statement published on the organisation’s social media channels read. Protesters also gathered in New York City in front of Trump Tower blocking traffic on Monday night while holding banners reading “Affirm LGBTQ Rights” and “Reclaim SCOTUS” as part of an impromptu protest organised by the National Action Network northeast regional director Minister Kirsten John Foy. Seven protesters were led away in handcuffs, the New York Post reported citing official sources.